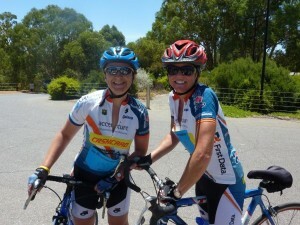 Me and my sister-in-law as we finished our second JDRF ride together. A great way to improve your cycling is to sign up for a charity bike ride. It gives you a fitness goal, and it also benefits other people who rely on the charity you assist. I started riding a road bike nine years ago to complete a charity bike ride for the Juvenile Diabetes Research Foundation (JDRF). And here I am nine years later – five JDRF rides, six years as a cycling blogger, five years working in a bike shop, and a totally obsessed road cyclist. When I talk about charity bike rides, I don’t mean the big mass participation rides like Sydney’s Gong Ride and Melbourne’s Around the Bay. Of course those events raise money for very worthy charities, but they are mass participation rides first, and charity rides as a poor second. In fact most riders don’t raise any money for the charities involved – me included. The charity rides I’m referring to, are boutique style rides where participants are required to raise significant funds, and challenge themselves in a single or multi day ride. Participants of the JDRF ride are required to raise $3,500 to attend, but in return they get a weekend away in the Barossa Valley, meals, drinks, accommodation and a fully supported bike ride that I guarantee will challenge the average ride. I call it boutique because it attracts around 400 participants. The big bonus is that you help kids who suffer from the awful disease of diabetes. There are plenty of similar rides around the country like the Sydney to CAMberra Ride that raises money for SIDS and includes a two day ride to Canberra from Sydney, the Tour de Cure which includes several different events throughout the year. Do your own research and find rides in your area. And I know you’re thinking that you can’t raise thousands of dollars in order to participate, but it’s much easier than it seems. You just need to call on your network or friends, family and work colleagues and use email, social media, events and be really persistent. I completed five JDRF rides and raised the required money five years in a row! Tell us about smaller a charity bike ride that you’ve enjoyed via comments or the Women Who Cycle facebook page. Chris Riley’s Youth off the Streets. An awesome ride with a fantastic bunch of people. 7 days of riding, averaging 130 kms per day. Seeded packs so ride at your pace. Raise $2000 and get a chance to win a car. 20th year next year, May 4-11, 2018.